1This is a short list of books on nationalism that I have found readable and useful as introductions to the literature. 3Gellner, E. 1983. Nations and Nationalism. Oxford: Blackwell. 4Smith, A. D. 1991. National Identity. Harmondsworth: Penguin. 6Ozkirimli, U. 2000. Theories of Nationalism. London: Macmillan. 8McKim, R. and J. McMahan (eds.). 1997. The Morality of Nationalism. Oxford: Oxford University Press. 9Couture, J., K. Nielsen, and M. Seymour (eds.). 1998. Rethinking Nationalism, supplementary volume, Canadian Journal of Philosophy 22. 11Miščević, N. (ed.) 2000. Nationalism and Ethnic Conflict. Philosophical Perspectives. LaSalle and Chicago: Open Court. 13Nyiri, J. C. (ed.) 1994. Nationalism and Social Science, special issue of Studies in East European Thought 46, nos. 1-2. 15Kuran Burcoglu, N. (ed.) 1997. Multiculturalism: Identity and Otherness. Istanbul: Bogazici University Press. 17Yuval-Davis, N. 1997. Gender and Nation (n. p.: Sage). 19Avineri, Shlomo, and Avner de-Shalit (eds.) 1992. Communitarianism and Individualism. Oxford: Oxford University Press. 21Kymlicka, W. (ed.) 1995. The Rights of Minority Cultures. Oxford: Oxford University Press. 23Miller, D. 1995. On Nationality. Oxford: Oxford University Press. 24Tamir, Yael. 1993. Liberal Nationalism. Princeton, New Jersey: Princeton University Press. 26Hardin, Russell. 1985. One for All. The Logic of Group Conflict. Princeton, New Jersey: Princeton University Press. 27A detailed sociological study of life under nationalist rule is: Billig, Michael. 1995. Banal Nationalism. London: Sage. MISCEVIC, Nenad. 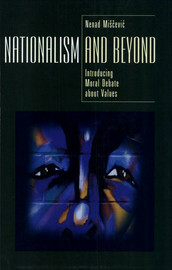 The beginner’s guide to the literature In: Nationalism and Beyond: Introducing Moral Debate about Values [online]. Budapest: Central European University Press, 2001 (creato il 19 avril 2019). Disponibile su Internet: <http://books.openedition.org/ceup/482>. ISBN: 9789633860083. Miscevic, Nenad. “The beginner’s guide to the literature”. Nationalism and Beyond: Introducing Moral Debate about Values. By Miscevic. Budapest: Central European University Press, 2001. (pp. 301-303) Web. <http://books.openedition.org/ceup/482>. MISCEVIC, Nenad. Nationalism and Beyond: Introducing Moral Debate about Values. Nouva edizione [online]. Budapest: Central European University Press, 2001 (creato il 19 avril 2019). Disponibile su Internet: <http://books.openedition.org/ceup/440>. ISBN: 9789633860083. Miscevic, Nenad. Nationalism and Beyond: Introducing Moral Debate about Values. Budapest: Central European University Press, 2001. Web. <http://books.openedition.org/ceup/440>.